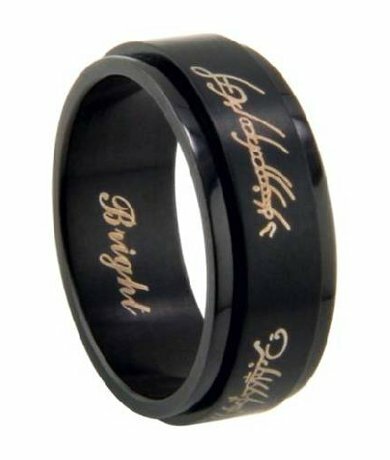 Monochromatic black-on-black stainless steel with gold Elfish writing adds to the mystique of 8.3mm spinner ring, giving it a striking appearance. One of our most attractive men's rings, this ring features a polished stationary inner band with a flat spinning outer band. Both bands are made from durable anodized stainless steel. Beautiful ring! The writing is clear and the band spins comfortably. My first order was a size too small, but replacing it was simple and done in a timely manner. Highly recommend! 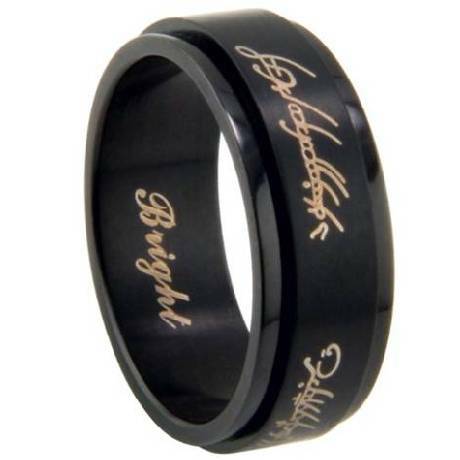 This ring is everyting it was advertized as and more. It is unique and looks better in real life than in the picture. Everone is asking about it and several strangers recognized what it was and asked how they could get one. The quality is more than equal to rings that I priced at more than $100.Thanks to the folks at Just Men's Rings for a great product, great service and fast shipping. Very cool ring, great fit. I bought this ring because i tend to fall asleep in class so in order to stay awake i waned a spinning ring to mess with and it worked great. A beatiful ring, my son was very happy when he received this ring.